SUBHEAD: Matt Taibbi says were too sure of our own influence, too lazy to bother hearing things firsthand. 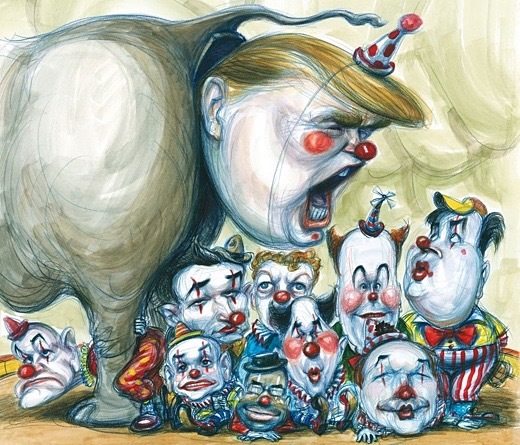 Image above: "Insane Clown President" illustration by Victor Juhasz. From (https://muffybolding.com/2015/08/17/its-always-darkest-before-the-don/). Most of us smarty-pants analysts never thought Trump could win because we saw his run as a half-baked white-supremacist movement fueled by last-gasp, racist frustrations of America's shrinking silent majority. Sure, Trump had enough jackbooted nut jobs and conspiracist stragglers under his wing to ruin the Republican Party. But surely there was no way he could topple America's reigning multicultural consensus. How could he? After all, the country had already twice voted in an African-American Democrat to the White House. Yes, Trump's win was a triumph of the hideous racism, sexism and xenophobia that has always run through American society. But his coalition also took aim at the neoliberal gentry's pathetic reliance on proxies to communicate with flyover America. They fed on the widespread visceral disdain red-staters felt toward the very people Hillary Clinton's campaign enlisted all year to speak on its behalf: Hollywood actors, big-ticket musicians, Beltway activists, academics, and especially media figures. Trump's rebellion was born at the intersection of two toxic American myths, the post-racial society and the classless society. CBC reports that the Rolling Stone columnist admits in his new book - "Insane Clown President: Dispatches from the 2016 Circus" - the president-elect got more than a few things right during an election campaign that brought to the forefront America's struggles with racism, class divide and economic stagnation. One of Trump's gambles that really paid off, according to Taibbi, was painting a target on the back of the U.S. political media. "The media and politicians had spent so much time with each other that they lost touch with regular people, and Trump capitalized on that. He made us in the media villains, representative of this out of touch, ivory tower political culture," he said. "I think there's some fairness to it, as much as I dislike Donald Trump, he hit a note, several notes, in this campaign that were true, and that was one of them." Another one, he says, is Washington corruption. Taibbi believes Trump was correct to say that both Democrats and Republicans have become more beholden to their political donors than to their constituents, and his vow to "drain the swamp" struck a chord. But he doesn't think Americans should hold their breath for their incoming president to fix any of the issues at the heart of his campaign rhetoric. "Even though his diagnoses on some things in some cases are accurate, it's his solutions that are the problem," Taibbi said. "He's not a deep thinker and his instincts for fixing everything are purely authoritarian." "We journalists made the same mistake the Republicans made, the same mistake the Democrats made. We were too sure of our own influence, too lazy to bother hearing things firsthand, and too in love with ourselves to imagine that so many people could hate and distrust us as much as they apparently do. It's too late for any of us to fix this colossal misread and lapse in professional caution. Now all we can do is wait to see how much this failure of vision will cost the public we supposedly serve. Just like the politicians, our job was to listen, and we talked instead. Now America will do its own talking for a while. The world may never forgive us for not seeing this coming."